Monica Amor writes and lectures regularly on postwar and contemporary art with special attention to interdisciplinary practices and the dynamics of global modernity. Her work has been published in Art Bulletin, Art Margins, Artforum, Art Journal, Art Nexus, Grey Room, October, Poliester, Third Text, Trans and other venues such as catalogues and edited volumes. She has curated several exhibitions, among them: “Altering History/Alternating Stories” for the Museo de Bellas Artes de Caracas (1996), “Beyond the Document” for the Reina Sofia in Madrid (2000), “re-drawing the line” for Art in General in New York (2000), “Gego Defying Structures” for the Serralves Foundation in Porto (2006) and “Mexico: Expected/Unexpected” for Le Maison Rouge in Paris (2008). She has lectured at The Ohio State University, the Wexner Center for the Arts, Sara Lawrence College, the Museo Nacional Centro de Arte Reina Sofia, the Museum of Modern Art in New York City, the Getty Research Center, the Newark Museum, Columbia University, the University of Vienna, the Museum of Modern in Warsaw, the Art Institute of Chicago, Duke University, the Henry Moore Institute, the Kunsthalle Basel, and others. Her book Theories of the Nonobject: Argentina, Brazil, Venezuela 1944-1969 was released in 2016 with the University of California Press. Her most recent essay is entitled “From Plasticity to Elasticity: Philippe Parreno’s Permanent Revolution,” (forthcoming Summer 2018). Her next book project is entitled Gego: Weaving the Space In-Between. Amor is currently teaching the Exhibition Development Seminar at MICA where her students are curating an exhibition entitled Counternarratives: Performance and Actions in Public Space to open at Decker Gallery, and throughout public locations in Baltimore, next Spring semester. 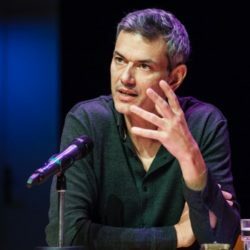 André Lepecki, Professor and Chairperson at the Department of Performance Studies at NYU, works and researches at the intersection of critical dance studies, curatorial practice, performance theory, contemporary dance and visual arts performance. Selected curatorial work includes Chief Curator of the festival IN TRANSIT (2008 and 2009 editions) at Haus der Kulturen der Welt, Berlin. Co-curator of the archive Dance and Visual Arts since 1960s for the exhibition MOVE: choreographing you, Hayward Gallery (2010). Curator of the lecture series Points of Convergence: performance and visual arts (2014), Off-Hinge Off Center: alternative histories of performance (2014-2015) and Performance in the Museum (2015) all for the Museum of Modern Art of Warsaw, and “The Future of disappearance” for the Sydney Biennial 2016. In 2008 he received the AICA Award for Best Performance as co-curator and director of the authorized re-doing of Allan Kaprow’s 18 Happenings in 6 Parts (commissioned by Haus der Kunst, Munich 2006; presented at Performa 07). Selected lectures include Museo Reina Sofia, MoMA-NY, Museu de Arte Moderna, Rio, MACBA, Para Site, Hong Kong, Haus der Kulturen der Welt, Berlin, WIELS, The Gauss Seminars at Princeton University, Freie Universität, Berlin, Brown University, UC-Berkeley, Federal University of Rio de Janeiro, École Superiore des Hautes Études en Sciences Sociales, Paris. In 2009 he was Resident Fellow at Institute Interweaving Performance Cultures at Freie Universität, Berlin. In 2015 he was Artistic Professor at Stockholm University of the Arts, where he helped develop the research profile area on Concept and Composition. He is the editor of the anthologies Dance (Whitechapel, 2012), Planes of Composition: dance, theory and the global (Seagull press, 2009, with Jenn Joy), The Senses in Performance (Routledge 2007, with Sally Banes), Of the Presence of the Body (Wesleyan University Press, 2004). His single authored book Exhausting Dance: performance and the politics of movement (Routledge 2006) is currently translated in 10 languages. His most recent single authored book, Singularities: dance in the age of performance, was published in 2016, also through Routledge. 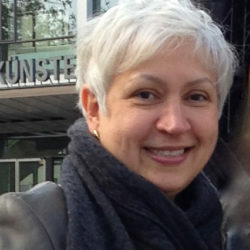 Simone Osthoff is Professor of Critical Studies in the School of Visual Arts at Penn State University. Born and raised in Rio de Janeiro, she taught at DePaul University and at the School of the Art Institute of Chicago before joining Penn State in 2001. Her bi-national experience shapes her dual role as a scholar and artist. 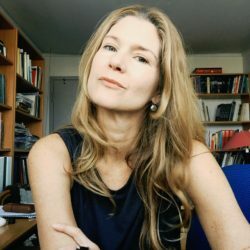 She holds a PhD from the European Graduate School, an MA from the School of the Art Institute of Chicago, an MFA from the University of Maryland, in addition to a BA from the Pontifícia Universidade Católica in Rio de Janeiro. Her scholarly and creative research examines contemporary histories and archives and focuses upon the Concrete and Neoconcrete movements, and among others, the work of artists Hélio Oiticica, Lygia Clark, Paulo Bruscky, and Eduardo Kac, as well as the philosopher Vilém Flusser. A frequent participant and organizer of international symposia, she is the author of Performing the Archive: The Transformation of the Archive in Contemporary Art From Repository of Documents to Art Medium. Her numerous book chapters, essays, and reviews have been published by the MIT Press, Routledge, and SUNY Press, for example, and in journals that include Leonardo, New Art Examiner, Art Journal, Ars, Flusser Studies, NMC Media-N, and the Russian Chto Delat. She is a Fulbright Fellow and part of the editorial board of the multilingual journal Flusser Studies. Her artworks are in a few museums and private collections and have been exhibited in venues such as the Chicago Cultural Center, the Museu de Arte Contemporânea of São Paulo, and the Documenta 12 in Kassel.